Re-posted from Just Seeds Blog by Josh M.
The Paper Politics show is still tearing up upstate New York! It open at the Redhouse Gallery in Syracuse tomorrow night. If you’re in the area, check it out! 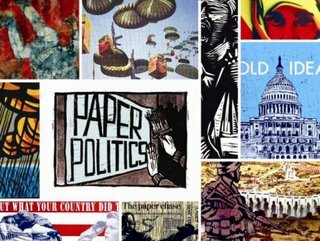 Almost 200 political prints from around the world, with work from all the Justseeds artists, as well as tons of other great printmakers like BSAS Stencil, Christopher Cardinale, Tom Civil, Sue Coe, Amos Kennedy Jr., Jesse Purcell, Favianna Rodriguez and Nicole Schulman.